I use this book with Kindergarten to show up close, colorful photos of the bees. The text introduces to the basics of bees – collecting nectar and pollen and life in the hive. The photos in this book are pretty incredible and I love that it is one of the only books I have that address bee’s classification as insects, their body parts, and their senses. I always start our Pollinator Unit with this book. It rhymes and has colorful illustrations that the kids love but most importantly, it connects what students have already learned about plant parts to why those plant parts exist – specifically flowers. 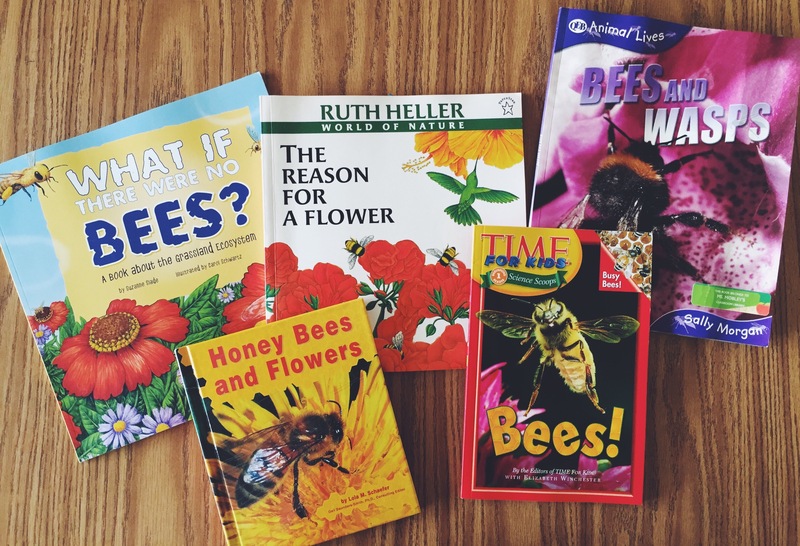 Leading to a conversation about how bees help the flowers fulfill their role and make the seeds. We only read up to the page where students discover that, “The reason for a flower is to manufacture SEEDS!” The rest of the book is a great read as well though! This book is a great resource to pull from for more in-depth lessons. The chapters cover both bees and wasps and have specific information on each stage of the life cycle as well as the roles of honeybees within the hive, and much more. This book is the best depiction I’ve been able to find about the larger affects the vanishing bees can have on an entire ecosystem. The book shows the food web of the grasslands ecosystem and then each page goes step by step through the chain reaction of plant and animals (and humans!) that would be affected with the disappearance of bees.